Where a wave is dissipated, the zonal mean flow is accelerated towards the phase speed of the wave. The closer the zonal wind to the phase speed of the wave, the more slowly the wave propagates vertically. In the presence of damping, this means that the waves do not propagate as far, confining their effect on the zonal mean flow to lower levels in the atmosphere. Think of two waves with identical amplitudes at the tropopause, one with westward phase speed of 20m/s and one with eastward phase speed 20m/s, propagating upwards. And think of the zonal winds as being zero initially. Each wave accelerates the zonal winds towards it own phase speed over the region over which it is dissipated, but these two forces balance initially — in this rather artificial symmetric state. Now suppose you break this symmetry by making the zonal winds slightly eastward say. The wave with eastward phase speed now has slower vertical propagation and transfers eastward momentum to the winds in a shallower layer. The wave with westward phase speed propagates further into the stratosphere and deposits momentum through a deeper layer. The result is an eastward push to the winds in the lower layers and a westward push in the upper layers. You can iterate this kind of argument to follow the evolution as these new zonal winds modify the wave propagation and dissipation, to show that these winds will strengthen, saturating at the phase speed of the waves, while propagating downwards. An important detail in generating oscillatory behavior is the necessity for a mechanism that mixes away the zonal winds near the tropopause — if there are eastward winds near the lower boundary of the stratosphere, while westward winds are descending and confining these eastwards winds to a shallower and shallower layer, a mechanism for destroying this shallow jet is needed to allow eastward propagating waves to bust through and propagate deeply to generate a new eastward wind layer at upper levels.See Alan Plumb’s paper linked above if interested in pursuing this. The QBO evolves very slowly by atmospheric standards. For this picture to make sense the equatorial stratosphere has to be very well protected from waves and mixing initiated from midlatitudes. The wintertime stratosphere in particular is full of Rossby waves and turbulence that have the potential to disrupt the stately progression of the QBO if they can mange to penetrate close to the equator and mix things up. It seems plausible that the unusual evolution of the winds in this past year was the result of this protection breaking down, allowing some extratropical influence to penetrate to the equator. It is hard to construct an explanation of the zonal wind evolution over the past year, with westward winds appearing sandwiched between eastward layers,if you confine yourself to the classic picture of vertical redistribution of momentum. Was the strong El Nino in part responsible for the unusual QBO behavior this past year? Was this behavior predictable, say, a few months in advance? Could it be telling us something about subtle trends in the stratospheric circulation that allow more extratropical influence on the equatorial winds? The stratospheric QBO missed a beat last year. 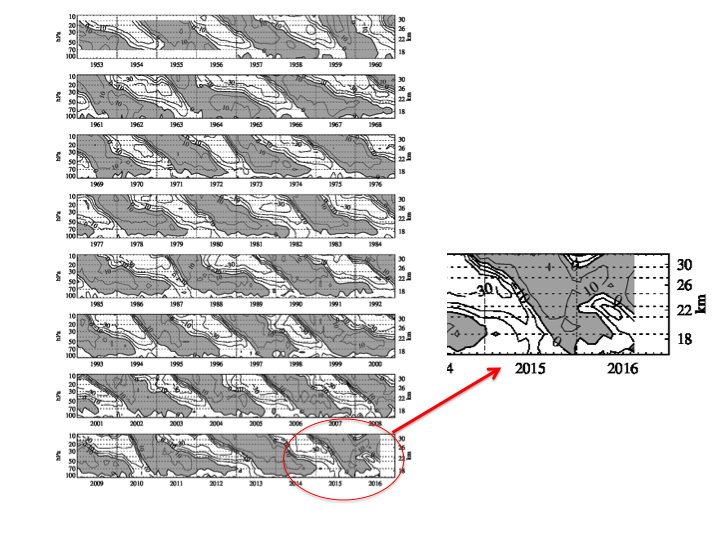 Or is it simply that the stratospheric QBO missed a beat? As you say in the post, the barriers between extra-tropical and tropical stratosphere appear to have been broken. imo, this could relate to the different amounts of realized CC in NH and SH. In lower level jet streams equator-crossing events are pretty regular, this could be similar and the first observed for stratosphere ? El Nino explanation likely also works, but why haven’t there been any similar observed occurrences previously? I am not aware of anything in the literature suggesting that ENSO can have this particular effect on the QBO. But this past El Nino event was big so it may be interesting to revisit this. oh, I thought this hypothesis was in the literature, since some blog comments have speculated on this pretty assertively. I just ran with it, thanks for this correction. Maybe the North Pacific Warm Blob had something to do with the QBO behavior, it at least has been as unique as the QBO missing the beat. Thanks for a nice summary of QBO mechanisms. I’m printing it out and leaving it with my copy of Holton’s 1975 book, so I can get the point behind all those equations. Re “missing a beat” two years ago: at last week’s CESM Whole Atmosphere Group workshop at NCAR, I didn’t hear the subject mentioned. Leaves me with a feeling that it no one has a compelling explanation.